Remember back when I mentioned that we bought some mead on our recent trip to Prince Edward Island? We drank it to celebrate our second wedding anniversary, with an all-Scandinavian meal inspired by The New Nordic, a cookbook by Simon Bajada. Well, I thought I’d share a couple of the dishes that I prepared as part of our Nordic anniversary feast. I’ll break this post up into two parts, but don’t worry: I’ll be dill-igent about getting the second part out really soon! Perhaps I should take a small step back and explain the whole Scandinavian thing? We are into all things Swedish, Norwegian, Icelandic… Because my husband Erick is learning Swedish. (And doing a great job, I must say! Or, “han gör et bra jobb.”) By extension, I am learning a fair bit about Nordic culture and music! So I thought I’d tackle a little Scandinavian cuisine as well. 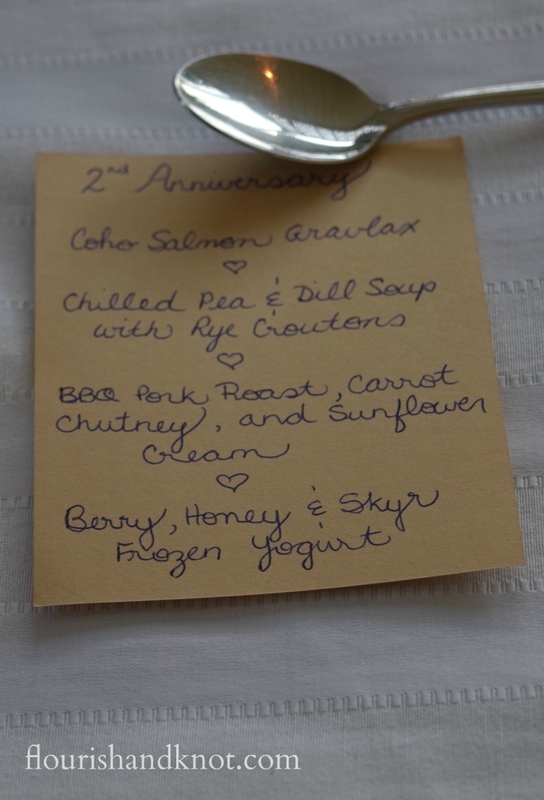 I’ll be sharing the recipes for the Coho Salmon Gravlax and the Chilled Pea and Dill Soup over the next couple of days. The gravlax is a fabulous appetizer, and the soup was Erick’s favourite part of the meal (although the mead ran it a close second)! We started off with the gravlax, which was super simple to prepare, but thoroughly dill-licious! Spread a thin layer of cream cheese on the bread slices. Add a piece of salmon to each slice. Add some capers on top of the salmon. Sprinkle some dill on top. Now, some of you may be leery about using capers: I was too. But really, they have less taste than olives and just add the perfect amount of saltiness to this kind of dish. I highly recommend a second chance for those little guys! This is a perfect appetizer for summer entertaining, as it requires NO oven time whatsoever and can be whipped up in under ten minutes. I hope you’ll give it a try! So tell me: what is your favourite appetizer for summer or last-minute entertaining? Do you have a standby recipe whose ingredients are always in the pantry? Leave a comment and let me know! I love to hear from you. This post was featured at My Urban Family! If there is one thing I can’t get enough of, it’s smoked salmon. This looks so wonderful and I love that you went with the rye bread. Love the puns too! Rye bread is my big découverte of the year – I just love using it as the base for canapés. Thanks for reading! Excellent! If you do, please let me know how you like it. Sounds like a delightful meal, I hope you had a nice anniversary! Anything salmon, I AM COMPLETELY on board with! Me too – so delicious! Oh My! That looks amazing and we just love salmon. Thanks so much, Haley! And thanks for re-blogging it! Reblogged this on Haley's Vintage. This looks wonderful, and I’m sure it tastes delicious! What a treat to eat 🙂 Thanks for sharing your lovely post at Together on Tuesdays and congratulations on the Feature!!! Thanks, Lisa! I’m glad you enjoyed reading it, and I highly recommend it as a no-cook appetizer for these hot summer days. We love to have salmon at our house. We just bought some lovely smoked salmon that this would be perfect for. The rest of your menu looked amazing too! Smoked salmon is just so, so good and such a fabulous treat. Thanks so much! I’ll be there.